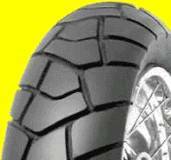 in the US are Bridgestone Trailwings. These are considered decent, with so-so off road traction and pretty good on road traction. 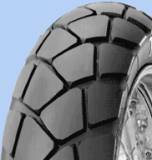 Stock tire sizes are 110/80 19 front and 150/70 17 rear. My front Trailwing lasted 12k miles. my rear lasted 14k miles. I consider this exemplary mileage for a reasonably sticky tire. 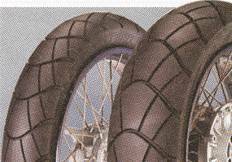 For street use, your front tire should be at 37-40psi. 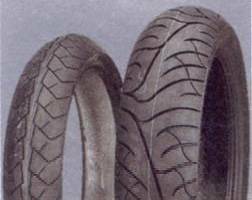 Although the bike will feel just fine with 32psi in the front, modern radial tires will develop a strange wear pattern with low air pressures, particularly if you ride for long distances on hot days at freeway speeds. 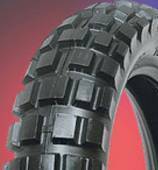 For best handling off-road, reduce your tire pressure to about 20-22 psi front, 22-25psi rear. If you do this, bring a small lair pump to get the tires back up to 37-40 when you get back on the road. 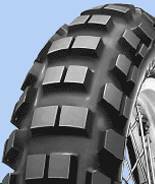 Reducing tire pressure for off-road makes a huge difference in the bike's stability. V-Stroms are an all-purpose bike, so the tire you would choose depends on your purpose. If you want to go to the track,D208s are a good choice. If you ride only on the street and want reasonable mileage and good cornering performance, BT020s area good choice. For 90% street dual purpose where you will only be on dirt roads, no mud, snow, or sand, the Trailwings,Anakees, or Tourances are good choices. For 50% street dual purpose, the TKC80s are a good choice, but they won't work real well in street corners. There's a rider in LA with a 17 tooth countershaft sprocket and Metzeler ME880 tires running at the maximum allowed pressure (55psi), who claims he regularly gets 52-55 mph cruising on the freeway at 75-90 mph indicated. If you're interested in best gas/tire mileage, this is the way to go. 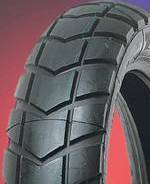 Generic information on tires is here. Metzeler ME880 - Highest possible mileage on-road, worthless off-road. Raises your bike about ½". 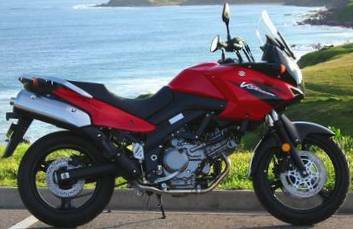 The V-Strom puts out about 380 watts, leaving you about 100 watts of spare power. This is enough for an electric vest, a set of electric grip heaters, and a radar detector. Two electric vests if you turn your grip heaters off. 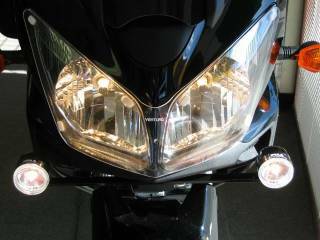 The V-Strom doesn't really have enough spare electrical power for a pair of driving lights. If you want more light, I recommend the Silvania Silverstars, PIAA, or Plasma Ultra White bulbs. Plasmas are $15 / pair at Walmart. California Sport Touring Aux Light Bracket. Attaches under your fairing and holds lights. About $50. Lights extra. Careful, you mustn't get a pair of 55 watt lights and run them a lot - the 'Strom electrical system simply won't handle this. Lights are available at AVM stuff, or at your local automotive parts dealer. Lockhart Flush Mount III Turn Signals.Won't break when you tip over. Available with or without running lights. About $16. 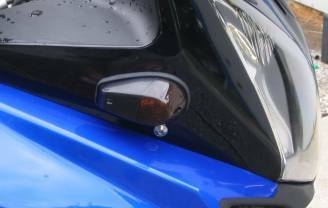 Use a horn lead wire to attach a couple accessories to your bike, such as heated grips. There's an available plug behind your radiator with orange wires, taped with black electrical tape against one of the wire bundles. Loosen your radiator, find the plug (a flashlight helps), and us an x-acto knife to cut the electrical tape holding the plug to the wire bundle. A needlenose pliers helps to push the male extension onto the female plug. The horn lead, Part #36852-06G00will fit the plug and accepts spade lugs. About $7. Required: 10mm socket, philips screwdriver, pliers, 6mm bolt, two tie-wraps. 10mm wrench, remove the front right-side bolt on the luggage rack. Loosen the left front bolt about 3/4". Loosen the two rear bolts about 1/4 - 1/2". Bare hands, grab the black side panel joining the fairing, gas tank, and side panel, pop out the two retaining plugs and rotate the panel up about 2". No need to remove the allen bolt at the front of the black side panel. Philips screwdriver, remove the revealed screw on the front of the right side panel. Push in the release nub on the plastic removable rivet, front underside of the side panel near the rear brake fluid reservoir. Pop out the rivet. Pull up on the luggage rack so that it clears the top edge of the side panel. Remove the side panel. Charcoal canister is now visible. Tug on it, the rubber retaining band will pop off the metal clips on the bike. One hose goes up to the gas tank. Remove that from the canister, and use a tie-wrap to secure it to the rear sub-frame right where it bolts to the main frame. The other hose goes up to the air box. Look between the frame and the gas tank, there's a joint in the hose about 5" forward of the rear of the gas tank. Break the hose at the joint, and remove the white plastic joint. Get a 6mm bolt (I used a nylon 6mm x 25mm), use it to plug the hose opening. Use the existing clip to hold the bolt in place. Use a tie-wrap to secure the hose end to the air hose right next to it. Replace all plastic and bolts.